- Achillies vs. 5 Oracles, Achillies shows the strength of the Kaiser!! Powerful!! - Nao vs. Narcissus, Narcissus's powerful attack half hypnotized Athena!? But it does not work on Nao!! - June vs. Creon, June fights for the first time!! But gets beat up to near death by Creon!! Great danger!! - Ikaros vs. Creon, Determined to fight worthy enough of Daidaros's pupil! Creon Routed!! - Kyou vs. Romeo, When Marin is in great danger, Kyou finally appears! A fierce attack goes toward Romeo!! - Poseidon vs. Troy, Troy appears in front of Julian! But finally Julian is possessed by Poseidon again!! - Achillies vs. Troy, Even one of the 9 Thunderas are no match for Achillies's angry attack!! From Poseidon's mouth, Achillies is Sea Dragon!? - Shaka vs. Chac and 5 Oracles, Shaka's one attack sends the Oracles away!! But then, he positions himself for battle with Siva!! - Shaka vs. Siva, Facing his rival, Shaka finally, shows his mysterious power!! - Milo vs. Sekhmet, Sekhmet forces Milo into a hard battle!! But Milo launches his most powerful skill!! - Mu vs. Noh, A fierce battle facing the Angel of Virtue!! Mu's Cosmo greatly explodes!! - Seiya has become a mindless being!? What to do!? "Do you need help? ", asks a female nurse. "No. I can manage. Thank you! ", says Seika as she brings a wheelchair next to Seiya's bed. "Come on, Seiya! ", says Seika as she slowly slides her little brother toward the edge of the bed. Moving his body and limbs to position Seiya in the wheelchair, she wheels him out of the room to the park outside. "Ah... Such a beautiful day...", says Seika with the sun shining on her and her little brother's faces, but Seiya doesn't even blink from the blight rays of the sun. He is still and unmoving. The only sign he is actually alive is his breathing. Seika wheels Seiya next to a bench and she sits down with him beside her. She was about enjoy this day when suddenly, the clouds start to gather and darken. Rumbling can be heard and a lightning bolt strikes few feet from them! Seika can see 7 men appear wearing armors. Laughter coming from all of them. One of the Warriors of Zeus laughs silently, "Ha ha ha ha... So... It's true... Seiya is inactive..."
"Who are you!? ", shouts Seika, standing up. "I am Adad! The Borak Oracle! We're here to kill Pegasus!" "Move aside, girl! Do you want to to die with him!" Seika positions herself in front of Seiya, opening her arms to shield her little brother, "I won't let you hurt Seiya!" "FINE! DIE!!" shouts Adad, leading the 6 Oracles rushing over to attack Seika and Seiya, but right then a voice can be heard! "WAIT! 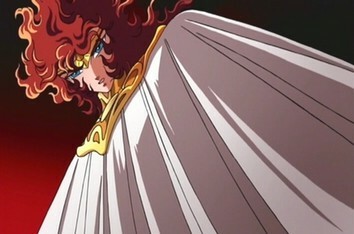 IF EVEN ONE HAIR IS HURT ON SEIKA OR SEIYA, YOU WILL LOSE YOUR LIVES!!" "WHAT! UH!? ", shouts Adad, as he turns to see 5 figures appear, wearing Bronze Cloths! "AH! YOU ARE...!? ", shouts Seika. Jabu leads the 4 Bronze Saints, rushes over to stand in front of Seika and the once Pegasus Saint. Adad starts to laugh silently again, "Ha ha ha ha... Bronze Saints? Fine... then it saves us the effort of finding you... Be ready to die here!" of kicks at Mach 5 toward Adad and an Oracle to Adad's left! "MELLOW POSION!! ", shouts Ichi as he pierces an Oracle to Adad's right with his posion fangs! "HANGING BEAR!! ", shouts Geki grabing hold of 2 Oracles behind Adad, strangling them! [RIONETTO BONBA-!! YATTA!!! MATA ZERIFU DA!!!!!!!!!!!!!!!!] shouts Ban who finally gets to say his Skill Name again! He moves his arms to form a cross concentrating his Cosmo there and releases an attack toward another Oracle behind Adad! But suddenly the 7 Oracles disappear and jump up! Together they descend and kick the 5 Bronze Saints sending them flying away to Seika's left, crashing in the grass there! Adad laughs silently again, "FOOLS! Do you think you Bronze Saints are a match to even one Oracle!?" He walks over to Seika and Seiya again, "So girl... You won't move... Okay then... DIE!!!!" But right then, singing can be heard! Adad shouts, "Wh... What is this singing...!? ATHENA!!" Laying on the ground full of pain, Jabu groans, "Miss... Sa... ori..."
Adad can't believe what he is hearing! He shouts, "This is not just any singing... THIS IS AMBROTOS-ZONTANOS! THE RESURRECTION METHOD OF THE GODS! THEN SEIYA CAN!?" "Uoh! 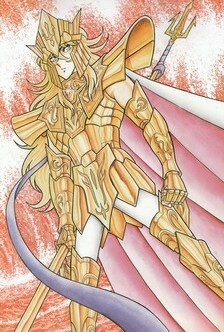 ", shouts Jabu who senses a powerful Cosmo, "This Cosmo coming from Seiya's room! Can it be!?" "Muhhh!! ", groans Adad looking at Seiya sitting on the wheelchair, "I can't believe it! Just a while ago, Seiya's Cosmo can't be felt but now it has risen to such a high level!" Adad can't wait any longer he rushes over to attack Seika and Seiya! He sends a punch toward Seika just when he thinks he is about to connect, suddenly an object punches through the window of Seiya's Room! The object flies directly above Adad and sends a flash in between him and Seika! With an unseen force, Adad bounces meters back! "IT IS THE PEGASUS CLOTH!!" shouts Ichi! "THE CLOTH HAS RENEWED AGAIN!!!" shouts Geki! "THAT IS NEO CLOTH!!!!" shouts Nachi! 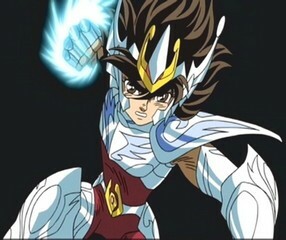 Seiya's body rises toward his Bronze Cloth and the armor of the Pegasus Cloth separates, each piece flying to his body and in a instant, he is wearing his Cloth, again! "SEIYA!!!!!!! ", shouts Seika, finally seeing his little brother moving by his own will! The Pegasus Saint lands back on the ground and Adad groans, "UH!!" "BURN! ", shouts Seiya, "MY COSMO!! UOHHHHHHHHHHHHH!!! [MOERO! ORE NO KOSUMO YO!! UOHHHHHHHHHHHHH!!! PEGASUS SHOOTING STAR PUNCH!!!!!!!!!!!!!!!!!!!!!!!!!!!!!!!!" Finally, the famous attack is launched by Seiya! At light speed, he sends millions of punches heading for the Oracles! "GYAHHHHHHHHHH!!!!!!!!!!! ", screams the Oracles as their bodies and Halos get smashed and punched to pulp! All of them lands on the ground dead! Except for one!! Adad is floating in the air!!! "What!? ", shouts Seiya. Adad laughs silently again, "ha ha ha ha..."
As Adad slowly rises back to Heaven, Seiya shouts, "You want to run away from this fight!?" "I don't need to run away from you... If you want to continue this fight, come to Heaven! That is... if you can... HA HA HA HA HA!!!!" 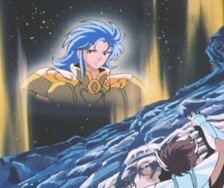 Slowly, Adad disappears from this earth, Seiya says to himself, "Heaven...?" As he is thinking about this prospect of entering Heaven, he hears a tender voice, "Seiya..."
Seiya turns and he sees his Sister, Seika from a distance. After all this time, of not seeing her, of not being with her, finally, finally, he gets to reunite with her. "SEIKA MY SISTER!!!!!!!!!!!!!!!!!!!!!!!!!!!!!!!!! ", shouts Seiya as he runs toward Seika. "SEIYA!! ", shouts Seika as she hugs Seiya tight! Seeing Seika and Seiya holding so close, so tight, the Bronze Saints can't help but smile. "THIS IS SO GREAT!! ", cries Ichi, who can't stop the tears! Seiya wants to hold his sister forever but he knows he can't. He lets go and says, "Sister... I have to go..."
"I know..." says Seika smiling, also letting go of him, "Remember always, Seiya... Never give up hope...!" Seiya turns to Jabu and the Bronze Saints and shouts, "COME! EVERYONE! TO ATHENA!!" Episode 20: The Opening to Heaven!! They run into the Pope's Palace expecting it to be empty, but 4 Saints are standing there guarding it! The Oracles stops. One of them asks, "WHO ARE YOU!?" "KAISER SAINTS!" shout the 4. Another Oracle shouts, "Ha! Do you think the 4 of you can... UH! THAT POSE!" The Oracle can see the 4 Kaiser Saints coming together and standing in attack poses! Nao is kneeling on one knee, holding her arms together, her hands are clawing as if she is ready to launch something! 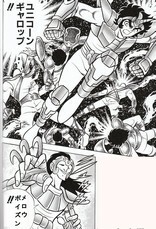 Achillies is standing behind and to the left of Nao and also holding an attack form with his arms! Kyou is standing behind and to the right of Nao, also holding that attack form! Ikaros is standing behind Nao holding his arms together, hands ready! “But you Saints are not allowed to use that!!! ", shout the Oracle. quickly against the Specters. After that war, Athena forever banned it from being used because it was too powerful, but later, the Goddess also recognized that there may come a time when it is needed. That time is when we Kaiser Saints are allowed to engage in battle. We Kaiser Saints with Athena's permission can use this attack! ORACLES! YOUR DIRTY FEET WILL NOT SOIL SANCTUARY AGAIN!!" "AH!" exclaims Athena at Athena Temple! Though in a small scale, the massive energy is equivalent to the once Big Bang that created our universe! The massive destructive power heads straight for the 20 Oracles and together with the Pope's Palace, they explode! With pieces of temple flying all over the place, the Oracles are defeated! Standing in front of Athena Statue, Athena is very distressed, but interestingly enough, not because of the AE! She is troubled because she can sense a Big Cosmo descending into Athena Temple! That Cosmo can rival hers and Zeus's! The sky is dark, filled with black clouds. Thunder and lightning are striking everywhere, but somehow the Sun is penetrating that cover and directing a light toward the ground of Athena Temple, almost as if a spotlight is shining down to highlight the one who is arriving from Heaven! A man descends with the light and lands opposite of the Goddess! "I KNEW YOU WOULD FINALLY APPEAR!" 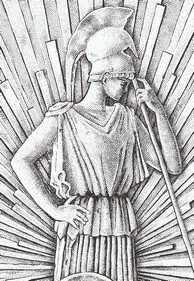 says Athena, "THE GOD OF THE SUN! APOLLON!!" disobeying Him and protecting these worthless mortals?" Athena has been worried this whole month, not just because of Zeus or what he would do, but she also suspected that Zeus would send Apollon to lead the 140 Oracles to launch a land assault, before the other Gods would descend. "All the Olympus Gods of Heaven have made their judgement, the land is destined to be destroyed! Forgo it, Athena!" "NO! APOLLON! I WON'T ALLOW THE GODS TO DO THIS AND I WILL PROTECT THIS LAND! IF THE DESTRUCTION OF THE LAND IS DESTINED, I WILL FIGHT THAT DESTINY AND SO WILL MY SAINTS!!" "ATHENA...! ", shouts Apollon, growing in anger, bringing his right hand close to Athena's throat! "MAYBE I SHOULD KILL YOU NOW AND END THIS QUICKLY!" Apollon starts to ignite his Cosmo! Just by the sheer force of the Sun God's hidden Cosmo, Athena's hair is blown back! "APOLLON...", says Athena, calm, and composed, "YOU CAN KILL ME, BUT YOU CAN NOT DEFEAT ME! YOU OF ALL THE GODS KNOW, ALL I NEED TO DO IS..."
"SHUT UP!!!!!!!!" shouts Apollon as he creates a Cosmo energy in his hand! He was about to launch it at Athena when! "WAIT! APOLLON!! ", comes a voice, "DON'T YOU THINK YOU ARE A LITTLE OVER ANXIOUS!?" "MUH!" groans Apollon looking over to the man appearing, "WHAT!? YOU ARE...! SEA KING, POSEIDON!!" Wearing his Scale, Poseidon walks over to stand beside Athena, facing the God of the Sun! "Well... What should we do, Apollon?" says the Sea God, "Should we open this Gods' War right here!?" "Ha!" snares Apollon in annoyance, "I am not foolish enough to fight 2 Olympus Gods at once... We'll call it quits for now..."
The Sun God slowly rises back to Heaven, shouting, "Athena, Poseidon! If you two don't value your lives, come to Heaven!" As Apollon's giant Cosmo disappears, Athena raises her left index finger to point at her forehead, a little above the eyebrow, almost she is marking the occasion, and finially she says out loud, "Shaka... I understand... Looks like it's time to awaken... NAKAMICHI..."
Right at that moment, in Sagittarius Temple, the Gold Cloth there shaped like a Winged-Centaur holding a bow and arrow suddenly rises with Cosmo. The Cloth shoots a beam of light toward the heavens and an Opening is revealed. - In the manga, the first time we saw the Sagittarius it was actually a fake reshaping to hide it from the eyes of Saga, but later it was reshaped back to its original form right before Seiya wears it. In the new Sagittarius Cloth, the general form is the same but the detailed decoration is much like the God Cloth. Episode 21: Awaken! The Middle Way!! "ATHENA!!!" shouts Seiya who just arrived with Jabu and the Bronze Saints. He finds Athena and Poseidon are gone and even Athena Statue has disappeared! The 4 Kaiser Saints are here with Solent. Shiryu, Hyoga and Shun are standing next to June, Shaina and Phaeton wearing their respective Neo Bronze Cloth, Dragon, Cygnus, and Andromeda. Seiya looks around but he can't find his master, he asks, "Where's Marin?" "My Sister is gone..." says Kyou, gravely. The appearance of Kyou overwhelms Seiya, not just because he is the little brother of Marin but also because he is a Kaiser Saint! He is happy finally these two siblings have found each other but he is very worried about Marin. He asks Kyou, "Where did your Sister go?" "I don't know but your Master left you a message..."
"Seiya, please seek Metis...? ", reads the Pegasus Saint, full of puzzlement. "What does that mean? ", wonders Shiryu. "Where would we even start...? ", questions Shun. "Well, judging that Marin would give you this message now, we should start in Heaven...", says Hyoga. shown us the way to Heaven!" From Sagittarius Temple, a beam of light is directed toward Sagittarius Constellation, toward the Center of the Milky Way. The Galactic Center is where the Opening of Heaven resides and it is there that beings can enter Heaven! "All we need to do is use our wings on our Cloths! ", continues Seiya. "NO!" comes a voice, "THAT IS NOT THE WAY TO ENTER HEAVEN!" Suddenly, everyone in Athena Temple can sense a Cosmo in the Heavens! They look up in the clouds and they see the image of! "SAGA!" shouts Seiya! "Do you want to die, Seiya?" asks the once Gemini Saint. "What!? Saga? What do you mean?" anyone else who tries to enter Heaven without that protection, they will perish the instant they come close to it..."
"But Saga! ", says Shun, "Other than Shaka, I can sense one or two more Saints have also entered that Opening, if I am not wrong, they must be..."
Saga interupts him, "I'm sorry but they might be dead already..."
"But, if on the way, they awakened the Naka Michi, they might be able to arrive in Heaven alive..."
"What Shaka said to Athena?" says Hyoga. "Athena is determined to fight the Gods but entering Heaven who has been ruled by Zeus from the time of the myths is not an easy thing. "People die and by the Will of Hades their souls are directed to the Underworld and their First Seven Senses are cut off and they only have the Araya Shiki... if they are considered evil, they will be directed to the Prisons of Hell, If their souls are considered good and pure, they will be sent to Elysion. "But, Heaven is different! Heaven is where the Gods dwell and Heaven is place where only those who are worthy enough to be with the Gods can enter. Only those who are chosen by the Gods or those who have awakened the Araya Shiki. "In this case, the Araya Shiki is actually a way to bypass the Will of Hades and not go to the Underworld. When you enter Heaven, your first Seven Senses will be cut off and you only have the Araya Shiki but right then, the Naka Michi will come out. You have to abide by the Rules of Heaven, even if you want to disobey you can't, so there's no way in that condition you can fight Zeus. So, you have to enter Heaven and disobey Zeus, and the only way to do that is, if someone follows the example of the Bodhisattva, they can enter the Sky World even without the Permission of the Gods..."
"You are talking about Shaka? ", says Hyoga, "The Reincarnation of the Buddha...?" "The Naka Michi or the Middle Way, in Buddhist terms means the Base or the Center... It can be considered the Second Stage of the Soul..."
"Then you mean!? ", shouts Hyoga. "YES!" shouts Saga, "YOU NEED TO AWAKEN THE SECOND STAGE OF THE EIGHTH SENSE!!" "SECOND STAGE OF THE EIGHT SENSE!! ", shouts the four! Heaven to fight Zeus freely!" "So...", says Shiryu, "It goes without saying that Athena applied the Middle Way to enter Heaven alive, but Poseidon and Shaka also did that too..."
"I have to believe those Saints also survived..." says Shun, "And for us, our Bronze Cloths are bathed in Athena's Blood... By burning our Cosmo to the full and with the protection of Her Blood, even if it just a little moment, we can awaken fully the Eighth Sense!" "THEN THERE'S NO TIME TO WASTE!" shouts Seiya, "SAGA! AIOLOS! THANK YOU!" Seiya burns his Cosmo and shouts, "OKAY THEN!!" "BURN THE COSMO TO THE MOST!!" shouts Shiryu also burning his Cosmo! "CREAT MIRACLE!!" shouts Shun burning his Cosmo to the most! "WE'LL MEET EACH OTHER IN HEAVEN, ALIVE!!" shouts Hyoga burning his Cosmo to the Eighth Sense! "AWAKEN!! THE MIDDLE WAY!! TOWARD!! THE MILKY WAY!!" shouts the four together! - Masami uses the word "Part" to denote the version of Cloth, but for the God Cloth explantion, the word "Part" is no longer used. For the time being I will use "version" instead. Bronze Version - After the fight with Hades when they put the Cloths back in the box, it will revert back to it Bronze version but evolved once again! Neo Cloth!! For the Hades Chapter Versions, the Dragon(Version 4) and Andromeda Cloths(Version 3) did not have wings yet, but now in the improved version, all 5 Bronze Saints have wings to hide. 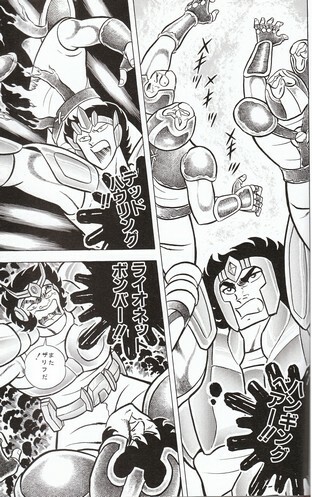 Shun and Shiryu won't need help from Seiya and Hyoga to cross hyper-dimensions. For Ikki, in Hades Chapter, it was helped by Pandora's All-Underworld-Passage necklace. After touching Athena's Blood, it doens't need that necklace anymore to invoke wings. Furthermore, all five will have added abdomen and groin guard, extended arm guard, almost all body guard now!! God Cloth - When they invoke the God Cloth again, it will be the same God Cloth, no change from before. As I said before the Cloth reverted back to its Bronze version when it went back to the box. The God Cloth is invoked with the permission of Athena, even if you have powerful Cosmo if Athena doesn't grant you that power, you can't get it.